Protecting a structure from the harmful effects of harsh environmental elements, primarily moisture, is one of the most effective strategies in preventing the need for expensive restoration in the future. From below grade applications or vehicular traffic coatings on parking structures to water repellents, sealant replacement, and elastomeric coating systems on commercial buildings, as well as the protection of fountains, planters, and architectural features on plazas, Everclear Enterprises, Inc. assists our clients in protecting their assets from the negative consequences of excessive water intrusion. Whether included as a component of a comprehensive restoration project, delivered as an immediate solution to an identified problem, or scheduled as preventive maintenance, our experienced staff and network of vendors and suppliers ensure that the protection we provide our clients is the right solution for their specific condition. Penetration of water through the horizontal surface and exposed vertical edges of both reinforced concrete balconies and timber framed balconies can result in deterioration of the balconies themselves – things such as concrete spalling, corrosion of balustrade connection points and bases, and failure of soffit coatings. 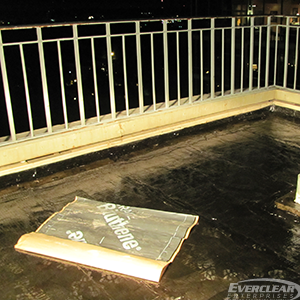 Because balconies are typically installed directly over occupied space or spaces intolerable to water infiltration, it is critical that the protective waterproofing system is adequate, installed correctly, and functioning properly. 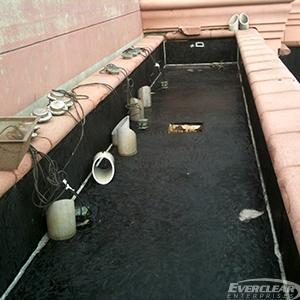 From replacement of failed sealant to installation of fluid-applied membranes under elevated paver systems, Everclear Enterprises, Inc. is experienced in addressing water intrusion issues on balconies, providing our clients the appropriate solution for the specific condition of their asset. 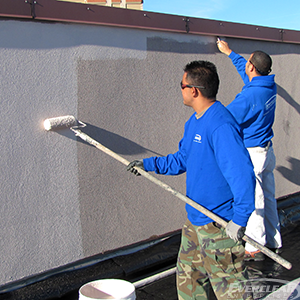 Below-grade waterproofing materials are subject to water conditions that are typically more severe than above-grade envelope areas. Structure elements below-grade are often exposed to hydrostatic pressure from ground water tables the can rise significantly during periods of heavy rainfall. Whether installing a surface drainage system to divert ground water away from a structure, excavating earth fill to install a membrane on the exterior (positive) side of a vertical wall, or applying a cementitious coating to the interior (negative) side of a wall, Everclear Enterprises, Inc. regularly assists our clients in protecting their structures from the significant damage that can result from the intrusion of ground water. Sealants are the most widely used waterproofing material. Most structures rely heavily on joint sealants for protection from water intrusion and the negative impact moisture can have on structural elements. In cases where there is failure of the existing material due to age, improper installation, inadequate movement capabilities, or poor joint design, removal of the existing sealant is required. 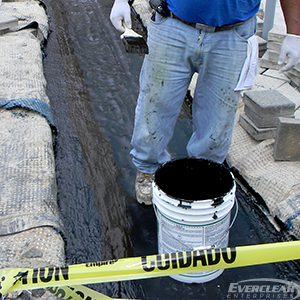 Everclear Enterprises, Inc. understands the importance of selecting the correct material for each particular condition and application. We take into consideration not only the environmental conditions and anticipated movement associated with the location in which the sealant is being installed, but also the chemistry and properties of the material we are going to install, so as to ensure that we provide an appropriate solution to our client. 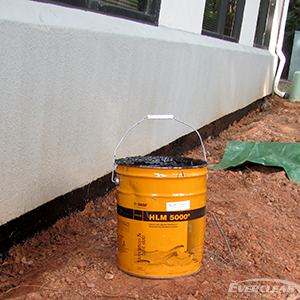 Used in both above and below-grade waterproofing applications, cementitious coatings can be a very effective solution for protecting against water intrusion on the negative side of a wall when addressing the issue on the positive side is impractical or cost prohibitive. 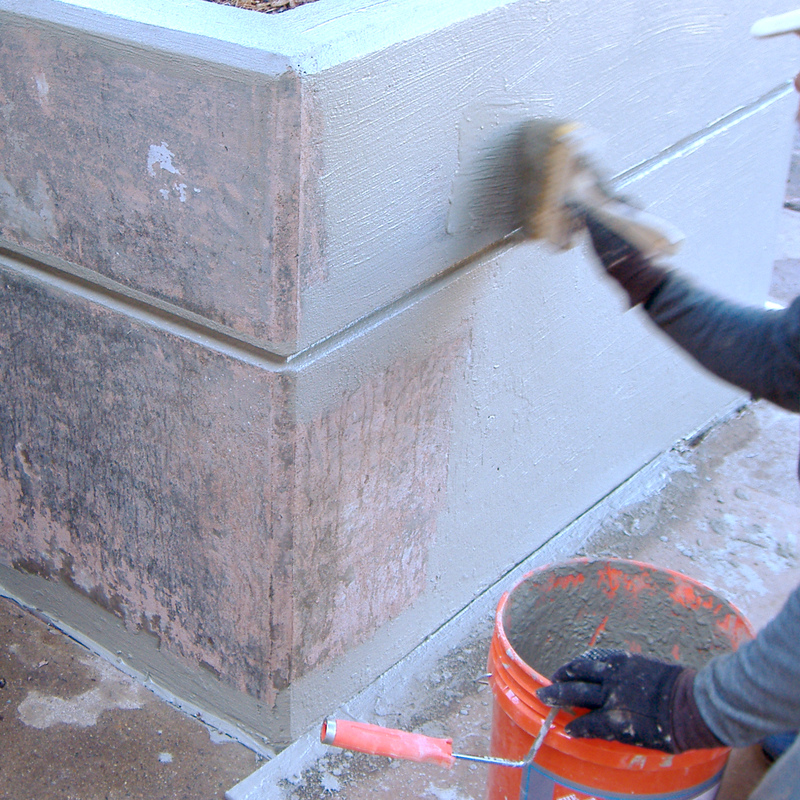 Additionally, in circumstances where altering the appearance of a concrete block or masonry wall is acceptable, cementitious coatings provide excellent protection from water intrusion on the positive (exterior) side of the wall. Though it does not have the movement capabilities of some other protective coatings, this issue can be nullified with the installation of control or expansion joints to allow for movement if necessary. 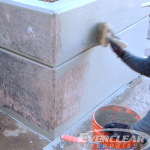 Everclear Enterprises, Inc. has successfully installed cementitious coatings on numerous concrete and masonry structures. Chemical grouting systems use materials that react with water in order to set up which make them ideal solutions for addressing non-structural water intrusion issues, particularly in below-grade applications when the joints, cracks, or surrounding soil is wet. Once the chemical grouting is completed the crack, joint, or void is completely filled with a flexible material that allows minor movement of the structure without compromising the water tightness of the repair. Everclear Enterprises, Inc. is experienced in providing hydrophobic and hydrophilic urethane injections to address cracks and voids in foundation walls, to prevent water pressure from expanding fissures into major fault points that could cause serious structural damage. While very different in design and application from one another, air, vapor, and moisture barrier systems are critical components of a building’s envelope. Designed to retard the transmission of water vapor through building materials, vapor barriers are particularly helpful in preventing the migration of water vapor from soil through adjacent horizontal concrete slabs or foundation walls. In the strictest sense, air barriers are also vapor barriers when they act to control the transport of moisture-laden air. Frequently, in order to restore a building’s structural integrity, it becomes necessary to remove and re-install portions of these barrier systems. 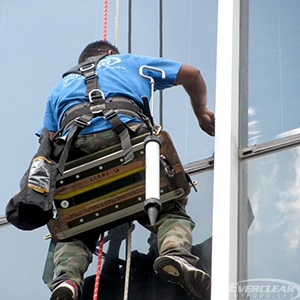 Everclear Enterprises, Inc. understands how these systems work in conjunction with one another to contribute to the building’s overall performance and incorporates their proper installation into their repair strategy. Elastomeric coatings can be a very practical and cost effective solution for protecting above grade exterior walls from water intrusion, while also providing a wide range of aesthetic options in terms of available colors and textures. 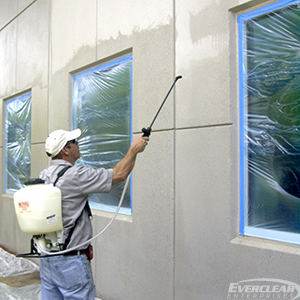 In addition to being particularly UV and weather resistant, other significant advantages over conventional acrylic coatings are that elastomeric coatings are flexible, allowing for thermal expansion and contraction of the surface; they can bridge small cracks in the surface of the coated wall; and they are also breathable, allowing water vapor to migrate through the coating rather than causing it to bubble. 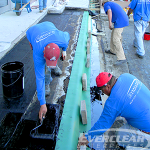 Everclear Enterprises, Inc. understands the importance of proper surface preparation and ensuring that the system is applied with uniform thickness in order to recognize the full range of protection the system is capable of providing. Buildings are not static structures; they move as a result of thermal expansion and contraction, wind force, and seismic activity. In addition to these conditions, parking structures and stadiums also have to have provisions built into their design to accommodate significant fluctuations in weight load. There are a number of expansion joint systems on the market designed specifically to accommodate the significant movement associated with the intersection of building sections, concrete slabs in parking structures, sidewalks and plazas, stadiums, bridges, and other structures. 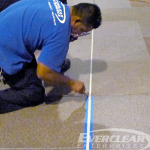 Everclear Enterprises, Inc. is a certified installer for many manufacturers’ expansion joint systems, including interior wall and floor joints, architectural joints, structural joints, parking structure joints, stadium joints, seismic joints, and fire barrier joints. Properly protecting a structure’s foundation from the potentially harmful and expensive damage that water can cause is an integral part of maintaining its structural integrity. Controlling groundwater is a key component of a successful strategy in providing this protection. There are a number of pre-manufactured soil and drainage systems that can be utilized to accomplish this. 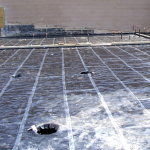 Additionally, there are drainage systems available that work in conjunction with both horizontal and vertical below-grade waterproofing systems that effectively reduce hydrostatic pressure against below-grade envelope components. Everclear Enterprises, Inc. routinely incorporates these relatively low-cost solutions into their below-grade repair strategy. Commonly a centerpiece of pedestrian plazas and architectural hardscapes on commercial properties, water features can greatly enhance the aesthetics and atmosphere of the areas in which they are used. They do, however, present unique challenges that must be effectively managed in order to ensure that these otherwise pleasing property enhancements do not become a detracting feature of the property. If not properly maintained, a water feature’s aesthetic qualities can quickly diminish. More significantly, it is important that water features not be allowed to become a source of unwanted water absorption or infiltration. 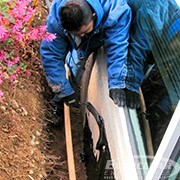 Not only can these conditions lead to unsightly aesthetics in the form of biological growth or deterioration of the façade (efflorescence, spalling, or bubbling of coatings), but also it can lead to structural deterioration of the water feature itself or adjacent areas of the property or structure. 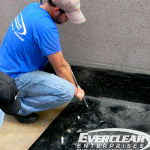 Because we can assist with both the waterproofing of water features, as well as the maintenance of them, Everclear Enterprises, Inc. is able to choose the right materials to ensure that our clients’ water features function properly and are protected with materials that will not break down from exposure to the chemicals necessary to maintain them in a sanitary manner. 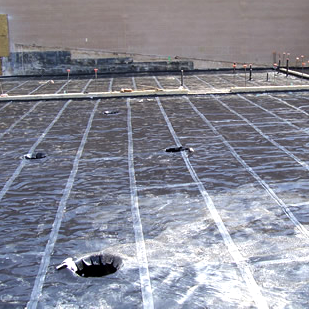 Fluid-applied waterproofing membranes are monolithic, seamless, and fully adhered systems. Hot-applied systems come in a solid block form which is melted down onsite and applied with squeegees. Cold-applied systems can be either single component, plural component or two coat reinforced membranes and are typically applied by spray, roller, squeegee or trowel. Either system can be applied to both horizontal and vertical surfaces, and are commonly used on roof decks, plaza decks, parking structures, split slab applications, vertical foundation walls, tunnels, planters, and water features such as fountains. 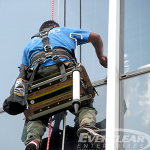 Everclear Enterprises, Inc. regularly utilizes these systems to address our clients’ issues, as they offer some of the best warranties in the industry. From manufacturing facilities and warehouses to loading docks and mechanical rooms on commercial buildings, a high-performance industrial flooring system, when properly installed and functioning as intended, significantly enhances the performance of the space it occupies. Like any other building system, however, it requires upkeep and maintenance to realize the full benefits of the system. 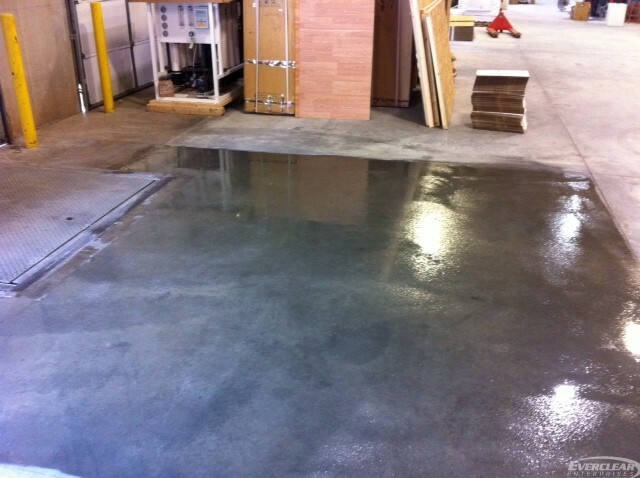 Through constant use, the presence of heavy machinery and mobile equipment, and transmission of water vapor, the underlying concrete can deteriorate, resulting in the flooring system’s becoming compromised. 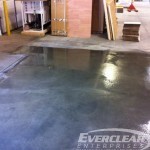 Everclear Enterprises, Inc. is experienced in making necessary repairs to the concrete surface of industrial floors to ensure they are structurally sound and that neither water intrusion nor water vapor is affecting the ability of the flooring system to perform as it should. We can also install sealers, stains, epoxy coatings, and numerous other topcoats, depending on the intended use of the space. Plaza decks typically consist of a concrete structural deck, waterproofing membrane, insulation, and pavers or a topping slab system. Proper drainage is a critical component in successfully directing the flow of water away from a plaza deck. 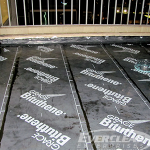 Additionally, because plaza decks are typically installed directly over occupied space or spaces intolerable to water infiltration, it is critical that the protective waterproofing system is adequate, installed correctly, and functioning properly. Depending on the construction of the top surface of the deck, there may be surface waterproofing systems, such as joint sealants and expansion joints, in addition to the waterproofing membrane at the lower structural slab. 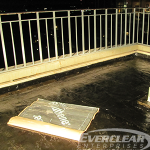 Everclear Enterprises, Inc. is experienced in identifying issues and making the necessary repairs to any of the waterproofing systems typically found on plaza decks to ensure that they are adequately protecting both the structure as well as the adjacent occupied space from damaging water intrusion. There is now an alternative to tearing off and replacing your weathered and leaking roof; existing roofs can be re-covered without any interruption to normal business operations. 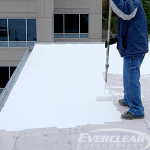 Utilizing silicone technology, elastomeric coatings are available that, when applied to existing roof systems, allow for thermal expansion and contraction and provide a seamless, monolithic, fully adhered waterproof coating that eliminates common sources of leaks and pooling water beneath roofing material. Additionally, these systems are extremely energy efficient, weather resistant, come with warranties that match or exceed those associated with installing a new roof, and can simply be re-applied to achieve a warranty extension. 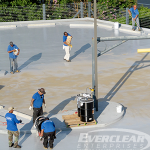 Everclear Enterprises, Inc. has installed silicone roof coating systems over pre-existing elastomeric roof coatings, metal roofs, built-up roofing, mineral cap sheet, and weathered single ply membranes. 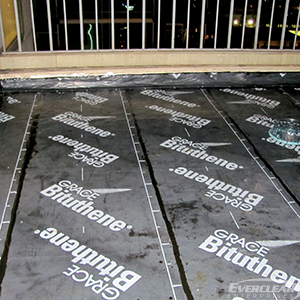 Sheet membrane waterproofing systems typically refer to thermoplastics, vulcanized rubbers, or rubberized asphalts. All of these membranes come in roll form and can be used in vertical and horizontal applications. Pre-fabricated at the factory, one of the distinct advantages of these systems is the uniform thickness achieved during the on-site installation. Rubberized asphalts also have the advantage of being available in self-adhering rolls laminated with a polyethylene film. Everclear Enterprises, Inc. routinely utilizes sheet membrane waterproofing systems in above and below-grade applications such as foundation walls, split slab construction, plaza decks, balcony decks, and planters. Through-wall flashing is used to divert moisture that has entered a cavity wall system or been collected by the existing damp proofing system back out of the wall, typically through a weep system. When the flashing system becomes damaged, or is improperly installed, the water that collects in the wall cavity migrates to the interior of the building, causing potential issues with mold growth and water damage. Through-wall flashing problems are commonly misinterpreted as roof or window leaks, though with further investigation, flashing system inadequacies can be identified and assessed. 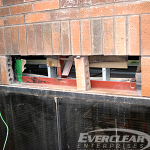 Everclear Enterprises, Inc. can remove the affected area of masonry directly over the lintel and install a new flashing system, vents and weeps to properly waterproof the cavity wall and provide a watertight condition. Vehicular and pedestrian traffic-bearing coating systems are designed to protect reinforced concrete parking structures, exposed concrete stairs, stadiums, balconies, and plazas where moisture intrusion cannot be tolerated. They provide a seamless, durable, skid-resistant “membrane” on the concrete, preventing the ingress of moisture and chloride that lead to premature deterioration of concrete and reinforcing steel. 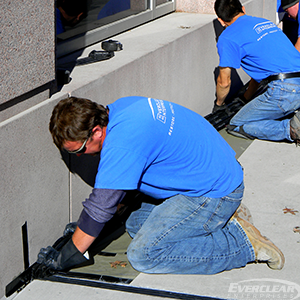 Further, a properly installed system also creates a waterproof barrier for conditioned spaces located below the coated surface. Everclear Enterprises, Inc. has installed both vehicular and pedestrian traffic coatings in numerous colors, textures, and formulations to meet the specific job requirements of each project. Clear water repellents are an excellent solution when wanting to provide water repellency to substrates where solid coatings are not acceptable as an architectural finish. Typically applied to concrete or masonry surfaces and appropriate for both vertical and horizontal conditions, a clear water repellent, while not providing 100 percent protection, can slow the rate of water absorption into the substrate of a structure by as much as 98% and provides protection against damage to the structure caused by the combination of water penetration and freeze-thaw cycles. Taking into consideration the structure’s design, the issue(s) of concern, and the desired aesthetics, Everclear Enterprises, Inc. can provide appropriate solutions utilizing penetrating or surface water repellents. In commercial structures, wet glazing typically refers to the use of sealants to adhere glass, metal, and other finish materials to the structural components of a building envelope. Though often a non-structural application intended to seal the joint between the glass and the perimeter frame or mullion system in order to provide a watertight condition, products with structural properties can be utilized if the glazing is serving as the primary attachment mechanism of the façade component to the structure. Whether replacing failed joint sealant or replacing gaskets that have deteriorated, shifted, or shrunk, Everclear Enterprises, Inc. is very experienced in providing wet glazing services on everything from single units that have developed leaks to complete window systems throughout the envelope of a structure.